A summer variation on the classic Middle Eastern dish. 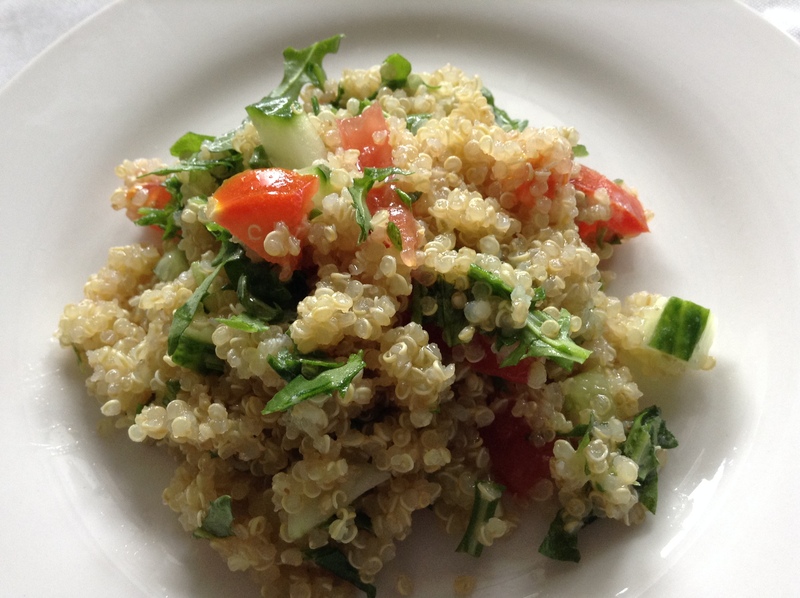 Gluten-free and packed with deliciously healthy fresh vegetables, this quinoa tabbouleh recipe is perfect as an accompaniment of meats, ideal for a packed lunch, or great o its own as a starter or healthy snack. I often prepare this recipe when I teach around lunchtime and in the evenings, so I have something healthy and most of all nutritious, to snack on when I am back home. Quinoa is a “superfood” which means that is one of those foods that exceptionally packed with nutrients, including a complete essential amino-acids count. Rocket, tomatoes and cucumber are ingredients that are so easy to find, and I am sure many of you will have some leftovers to use up. Perfect for a healthy lunch box to bring to the office, or as accompaniment to some meats, this gluten-free variation on the famous Mediterranean recipe, will keep light and full for long. Step 1 Finely cut the rocket leaves, wash and cut the tomato and two third of the cucumber in small pieces, and put them in a bowl with a bit of sea salt. Step 2 For the dressing: put the left over cucumber in a blender with a little water and a dash of lemon juice. Step 3 When the quinoa is cooked, put it in the bowl with the rest of the vegetables, pour the dressing and add a little of olive oil. Stir and eat! For more quick, easy and delicious gluten-free recipes you can check out my Zataar & turmeric rice.